If you experience issues with re-staining of your marquee sections in storage, this could be the result of the washing process not effectively drying the waxed fabric edges. We have the answer! “We were asked by Straight Eight Engineering to research and test methods to significantly improve the drying capabilities of their marquee washing machines. 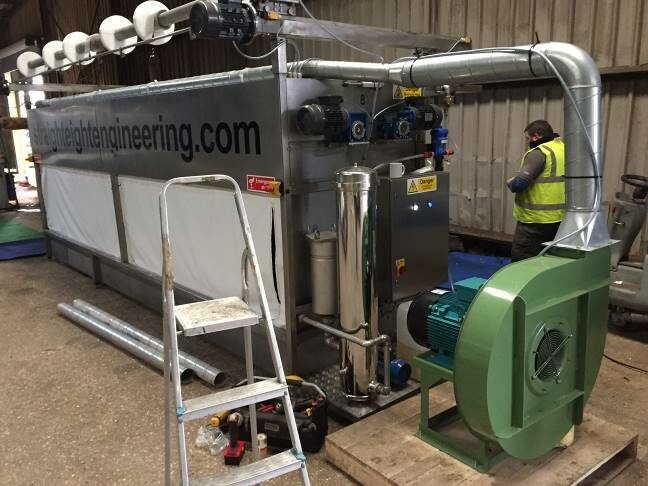 By implementing new technologies such as the Air Knife System powered by a centrifugal blower we have increased efficiencies and reduced on running costs.” Sean Harrop, from Air Control Industries. The Air Knife System is a low pressure, high volume air-delivery tool that is designed specifically to blow-off all surface liquid/moisture; clean web materials; and thoroughly dry all components. Their ease of installation, and low energy consumption makes them an efficient, cost effective solution providing significant savings over alternative thermal and compressed-air systems. *due to lower pressure operation, the expansion ratio and turbulence of the air produced is reduced significantly. Contact us to arrange a complimentary visit to see one of new S8E5000 and S8E6000 models in action. ← See you at the Showmans Show! See you at the Showmans Show! Receive a quotation for Marquee Washing Machines today. Copyright 2019 Straight Eight Engineering Ltd. All rights reserved.